The brief was to redesign Blaze Hill Cottage. Modifying the existing structure, combining some rooms, extending others - to provide a modern space to match the clients needs. 1. 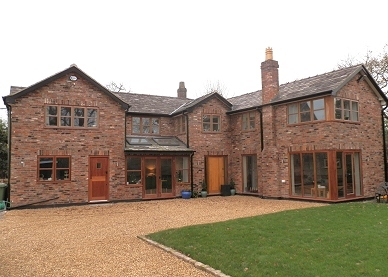 Refurbishment of Blaze Hill Cottage - Prestbury - AFTER. Space in the south gable was increased by replacing a single storey extension with a double storey extension. This gave the property two additional bedrooms and allowed the inclusion of an extra bathroom serving the guest bedrooms. A single storey extension was then constructed with double patio doors with floor to ceiling glazing on either side, and double skylights in the sloping roof. 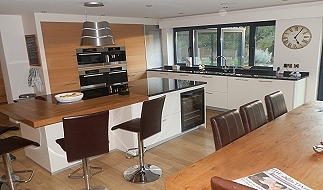 This gave the client a fantastic light, large, family room - combining a kitchen, dining and lounge area in one space. 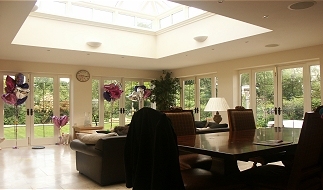 This compliments the larger living room in the east gable - again brought to life with large bifold doors on two walls. Small multi-glazed windows in the original building were replaced with larger modern windows. Existing brickwork was sand-blasted clean and new build sections used matching materials. It is important to deliver a whole concept (through to completion) so attention was also given to landscaping the land to the front, off-setting the newly refurbished house. 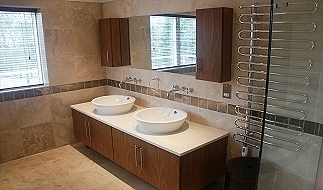 We were very happy to hear that the client was delighted with the finished project.